On her 18th birthday, Lena Mattacascar decides to search for her father, who disappeared into the northern wilderness of Scree when Lena was young. Scree is inhabited by Peculiars, people whose unusual characteristics make them unacceptable to modern society. Lena wonders if her father is the source of her own extraordinary characteristics and if she, too, is Peculiar. Set in a steampunk 1800’s, Lena Mattacascar’s journey takes readers from her quiet home in the City to the wild lands of Scree. Lena, with her abnormal sized hands and feet, is on a mission to find her father, determining whether she is, in fact, a Peculiar. The mystery surrounding Peculiars starts from the very beginning of the story. Ms. McQuerry gives readers insight into Lena’s childhood that generates an understanding for why Lena is so shaken up about her genetics. As the story progresses, more speculation about Peculiars comes to the fore. It’s said by hateful citizens that Peculiars are soulless and inherently evil. McQuerry draws readers in with the promise of finding out exactly what a Peculiar is and whether or not Lena should be labeled as such. The novel starts right off with Lena heading out on her journey. Along the way she meets many quirky characters who liven up the story and keep it from seeming too serious. McQuerry has a gift for creating characters and character names that fit right in with the alternative era. For instance, Lena meets an awkward Jimson Quiggley, inventive Tobias Beasley, and the murmuring Scree-cat, Mrs. Mumbles. Lena becomes a stronger heroine as her journey comes to a close. McQuerry does a wonderful job of taking this City girl and putting her through obstacles in which Lena prevails and makes something of her situation. 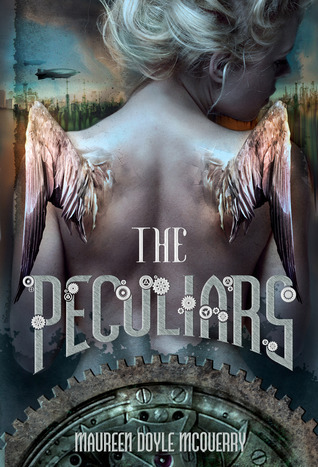 The mix of fantasy and steampunk, with a little dash of romance, makes The Peculiars a spectacular read!